Say you're looking for a long name for your baby boy and you can't think of much beyond Alexander or Maximilian. Fear not! Let this be your handy resource for long boy names! Every name on this list is 4 syllables long or more. There are definitely plenty of interesting, unusual choices and some international ideas borrowed from origins around the world. Which of these names are your favorites? Can you think of any that could be added? Share your favorites in the comment section below! If you're looking for some shorter names too, I got you covered! 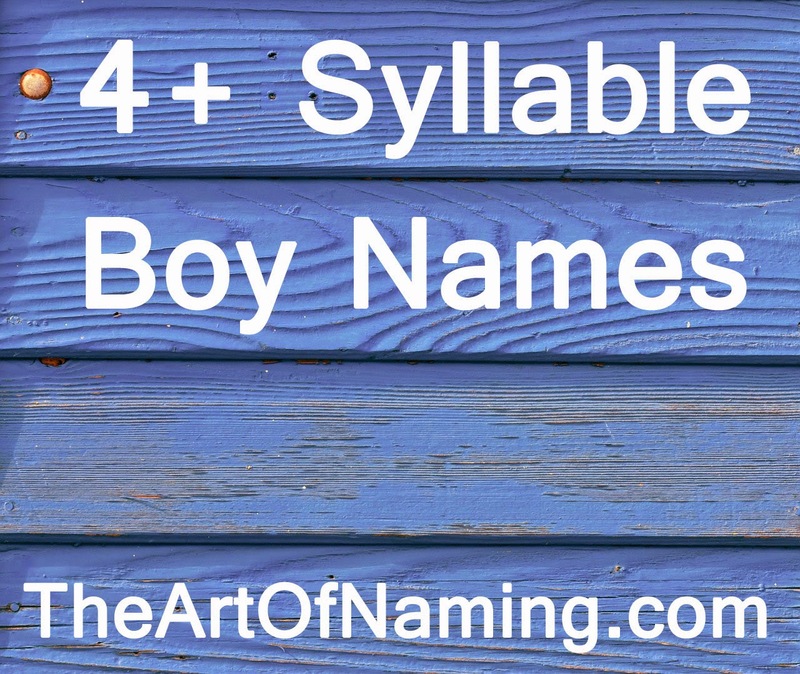 Here are some One-Syllable Boy Names as well as some Four Letter Boy Names! Next week, we'll explore long girl name possibilities! As one year winds down and another promises to begin, we are all given a sense of a clean slate. 2015 will bring about the feelings of a fresh start and many will have high hopes for the future in the form of resolutions. These similar feelings can also be experienced during pregnancy as we anticipate the arrival of a brand new, tiny person. Which of these do you like most? Share your thoughts in the comments below! This month's birth announcement list is full of some pretty wonderful choices! If you had to name triplets using just the names below, (keeping the first/middle combinations as they are), which would you choose? Share your answers in the comments below! It isn't officially winter yet, but the snow is already starting to fall in many places. There is something so magical about the white snow. 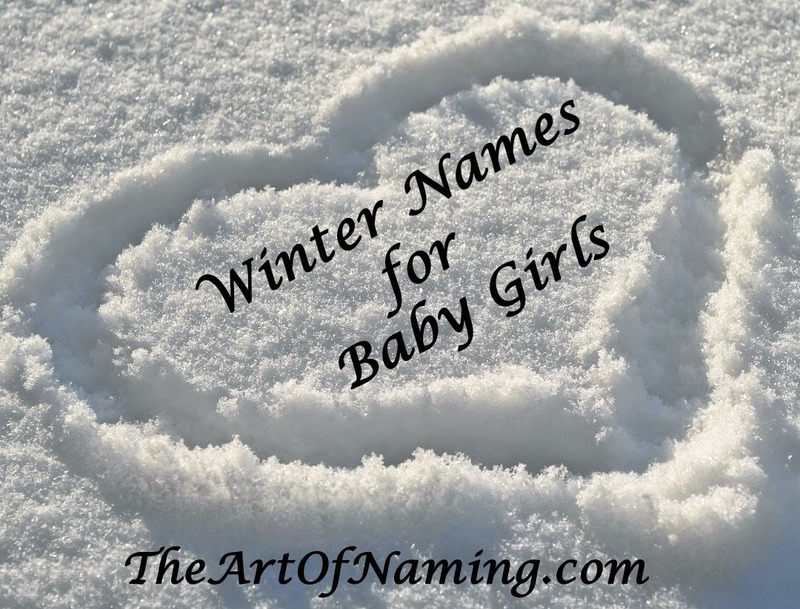 If you're a fan of sipping hot cocoa in front of the fire and gazing out the window as the snowflakes flutter down from the night sky, you may find yourself in love with this list of wintery baby girl names. There's also plenty of holiday-related choices for you as well if you're expecting a winter or Christmas baby! Which of these are your favorite? Can you think of any other winter or holiday names that should be included on the list? 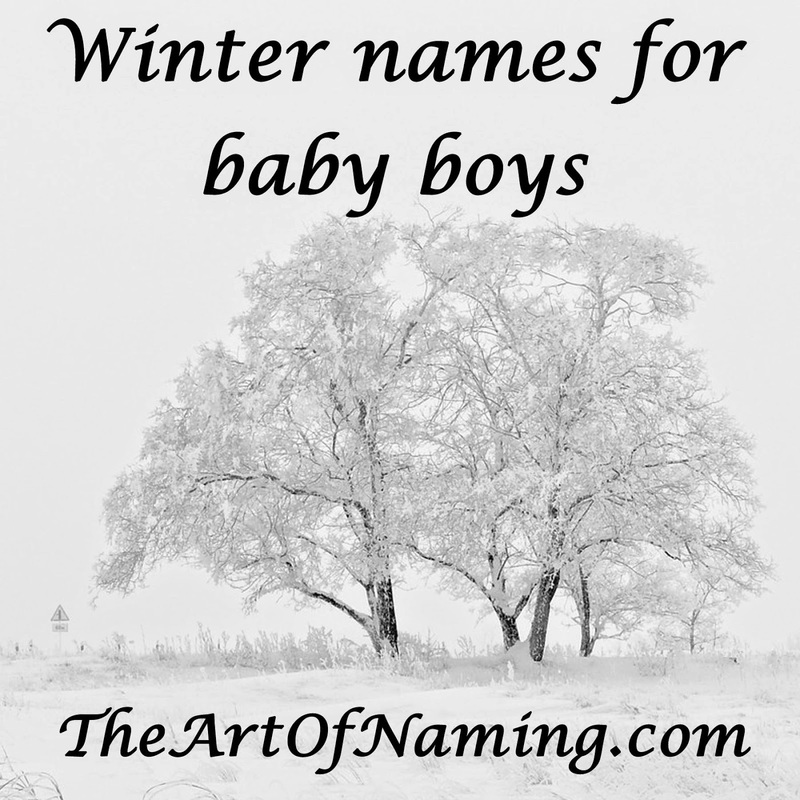 Don't forget to check out last week's post regarding Winter Boy Names too! Even if the first day of Winter doesn't officially arrive until December 21st, you're surely feeling a cold breeze or two by now. This magical, snowy time of year puts people in a rather festive mood. If you're expecting a baby this winter, you're sure to find this list useful for a timely name. If you're expecting a baby boy towards the end of December, well, you'll probably really love this list for its holiday-related ideas! Whether you like the chill in the air or the roaring heat of a fire, these baby names sure are wonderful. Which of these are your favorites? Can you think of any more names relating to winter or the holidays? Two polls were recently posted on our Facebook page and we've received quite a few votes, but we could always use more for the sake of the data! If you have a moment, vote for your favorite names within the US Top 100 chart. The polls are embedded below and your answers are completely anonymous! It will take a bit of scrolling to view them all but don't give up! Thanks for voting! Don't forget to share this with your poll-loving friends! You and your partner just found out that you're expecting a baby girl and you couldn't be happier. Immediately, baby names pop into your mind and you're determined to find one that will honor your beloved grandmother. The only problem is that you totally and completely hate her name. Oops! It's difficult when you love someone so much that you want to honor them but, in your mind, their name leaves little to be desired. You simply cannot picture yourself yelling at little Thelma across the playground and you couldn't handle saying Dolores a hundred times a day. These names work beautifully on your grandmother but they are not right for your modern daughter. What can you do? Here are ten exciting ways to reinvent, revamp and retrofit your loved one's name in order to fall in love with your choice while still honoring them. These will be in the order of most relevance to the person's actual name. The lower you go on the list, the less obvious the honor is. Perhaps you don't hate the name Elizabeth, but your sister and two cousins have already honored grandma Betsy by using Elizabeth and you'd like to find a name that will honor her in a different way. Take a step back and look at the international variations and diminutives of Elizabeth and you'll find that you could use nicknames such as Eliza, Elise or Beth as a given name, or you could go one step further and use the French Isabelle or the Spanish Liliana which come from Elizabeth. There's also Elsa and Lisette and Elspeth that catch your eye. Don't be afraid to explore alternative origins of the same name. If you love uncle Cecil but dislike his name, you could still honor him by naming a girl Cecily. If grandpa Willard's name just won't do, you could go with Willa or Willow for a girl instead. Or the other way around, name a son after great-aunt Phyllis by calling him Phillip. It's okay to name a girl after your grandpa or name a boy after your aunt. There are plenty of names that can be feminized or masculinized to honor someone even if you're having a baby of the opposite gender. Is your relative better known by a nickname rather than their proper given name? You could use that to your advantage by using that same nickname but applying a different given name to it for your child. For instance, you'd like to honor your father who goes by Harry. His real name is Harold which you don't like. Name your son Henry and let him go by Harry just like grandpa. Or name your little girl Annabelle after grandma "Annie" whose real name is MaryAnn. You've only ever known your great-grandmother as Dotty and later learned that it is short for Dorothy. You'd love to honor her but you just don't like either name. Finally, you think to ask if she ever had a middle name. To your surprise, her middle name was Grace. You and your partner are thrilled to discover this and immediately name your daughter Grace after your beloved great-grandmother. You never know when an excellent name could be tucked away in the middle name spot. Explore all of your options! You could potentially honor an entire lineage of people simply by giving your child your maiden name or another surname in the family tree. There are many surnames being used as first names today from Parker to McKinley to Harrison to Stone. Explore your options and perhaps you'll find that you can honor your whole family this way! Another way to honor someone without actually using their exact name is to use their initials. Take their first and middle initials and come up with a different name that you love for your child. This is a subtle but sweet way to give your child his own identity while still allowing him to feel a connection to that beloved relative forever. If you're honoring someone on your family tree, explore their name's family tree too. That's right, find a different but related name. For example, did you know that you could honor grandma Heidi by using Alice, Alison, Alyssa, Alicia, Ada, Adelaide or Della? Most people won't see the connection, but all of these names come from the Ancient Germanic root name "Adalheidis". There is a way to honor a loved one without actually using their name. 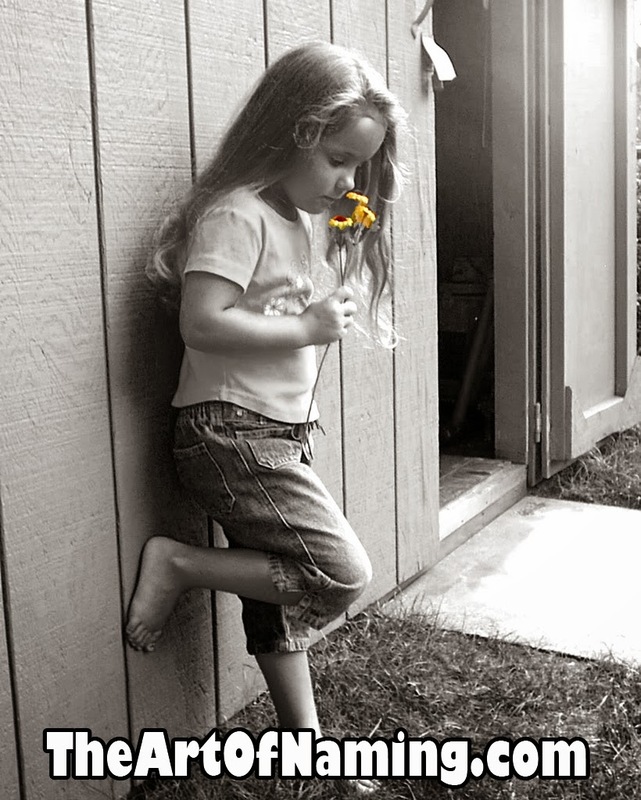 Maybe your mother's favorite flower is a lily. She even had lilies in her wedding bouquet. This would allow you to name your daughter Lily or even Lillian and still honor your mother because of the sentimental connection. You could even use the name that your mother would have used had she had another child. Or you could name your child after the city that your grandparents came from, or after your uncle's favorite song or sports team or fictional character. As long as it means something to you and your honoree, the sky's the limit! Another subtle way to honor someone is to give your child a name that has the same meaning as their name. You'd like to honor your mother-in-law Glenda but you can't find a way to do so and you dislike her name. You see that Glenda means "pure" so you search by meaning and find that the lovely Katherine also means "pure." It doesn't seem connected at all but since they have the same meaning, it works as an honor name in that regard. There's plenty of names that mean something in another language, too, that could be played with. You just have to dig deeper but this method would probably be a last resort if you cannot find a better way to honor someone. After exploring all of the above methods to honor someone even though you hate their name, you come to the conclusion that there is no good way to alter it. You'd rather use their exact name than creatively change it with a work-around, but you still don't like it enough for a first name. The answer is simple: put their name in your child's middle name spot. Choose a first name that you love that the child will answer to, but let their middle name serve as an honor for your family member or friend. What do you think about these methods? 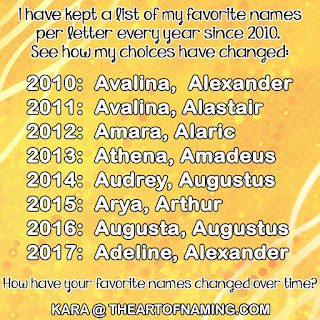 Which have you used when you named your child after a loved one? Along with dozens of other names, Elsa comes from the name Elizabeth. Of course, Elizabeth comes from the Greek form of the Hebrew name Elisheva. It means either "my God is an oath", "my God is abundance" or "pledged to God". Elizabeth has been extremely consistent in its popularity over the years, having always been in the Top 30 since 1880. The lovely German Elsa is also very consistent in its popularity since 1880 in the US. Since the release of the wildly successful movie Disney's Frozen in November 2013 featuring a Queen Elsa, the baby name Elsa is expected to leap up the charts in 2014. Before Frozen, Elsa originally gained popularity as a name among English speakers because of Wagner's romantic opera Lohengrin in 1848. Elsa was the name of the heroine in the opera. I chose to feature Elsa as part of Scandinavian week because, while it is mostly used in Germany, it also has usage in the Scandinavian countries, particularly Sweden and Norway. Even Iceland has love for it! Here in the US, Queen Elsa is everywhere these days so if you love the name Elsa but want to avoid trends and popularity, perhaps you should consider Elsie or Elise instead. 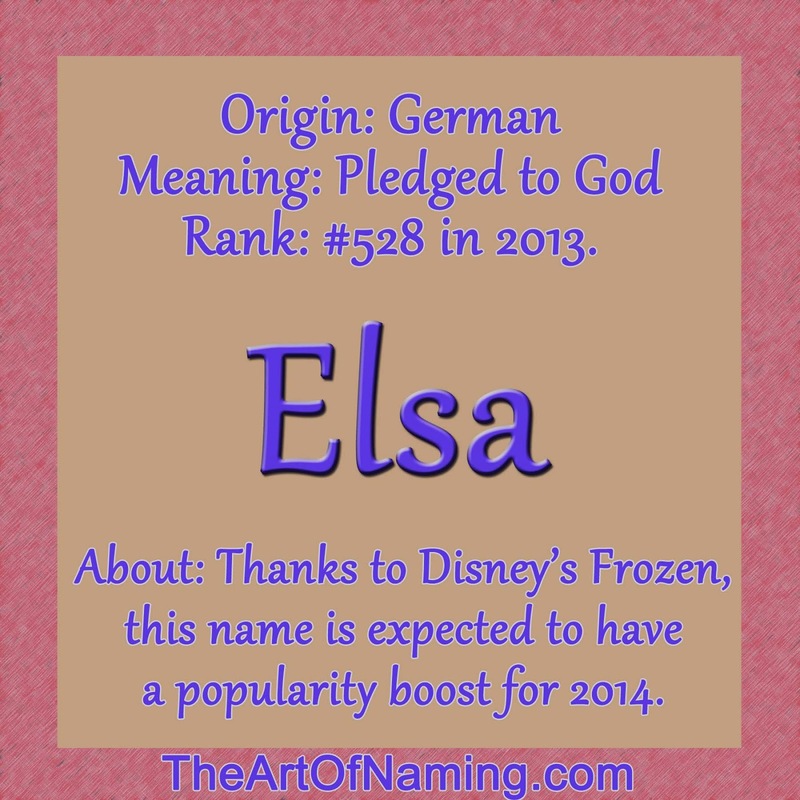 In 2013, there were 560 baby girls named Elsa for a ranking of #528. Right now it isn't ranked too high but I expect this name to break into the 300s, at least, in 2014. Elsa is a bit difficult to put in the middle name spot and also achieve good flow from first to middle to last, so it'd probably fit best in the first name spot. What names would you suggest to go with Elsa? Welcome to Scandinavian Week! You may have seen the polls that I made on the sidebar of the blog and maybe you even voted for your favorite Scandinavian names for each gender. After a tie-breaker, the winning male name was Magnus. 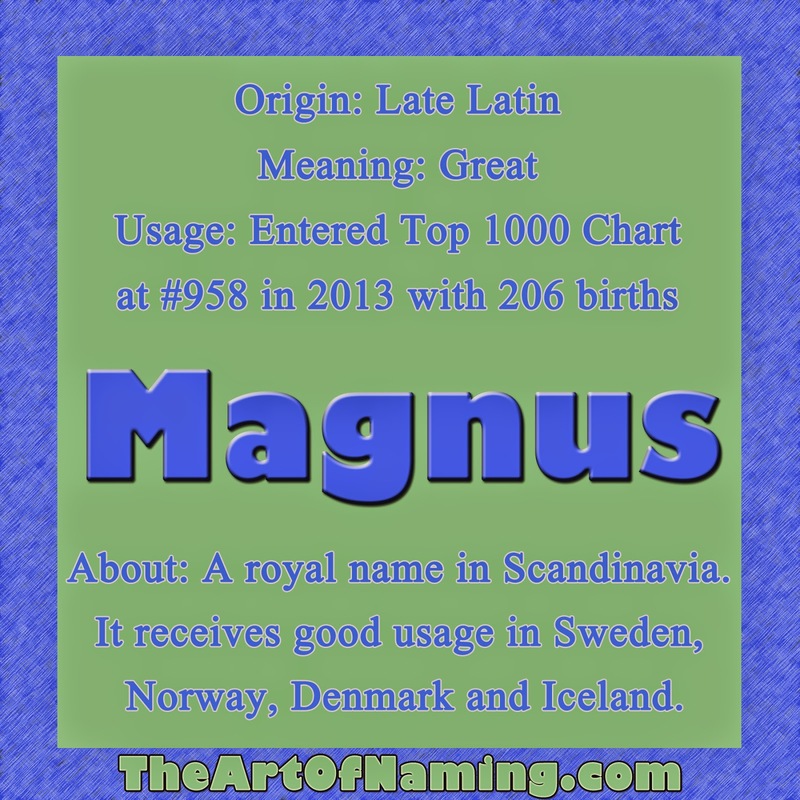 Magnus is a Late Latin name meaning "Great" but it is heavily used by Scandinavians, particularly those from Sweden, Norway and Denmark. It became popular in those countries because of the 11th century King Magnus I of Norway. It was said that King Magnus I may have been named after another ruler, Charlemagne, who was also known as Carolus Magnus, or Charles the Great. Others who bore the name Magnus include a 7th century saint, 6 more kings of Norway, and 3 kings of Sweden. In the middle ages, the name Magnus gained usage in Scotland and Ireland. Manus is an Irish variant of the name. There's also the Finnish variants Manu, Mauno and Maunu, and the Danish Mogens. Interestingly, from Magnus sprang forth the Medieval English name Mack which then led to the name Maxwell, which is a Scottish place name then surname. In the US, Magnus was used sporadically from 1890 until 1981 when it gained yearly regularity. However, it has always been rare. 2013 is the first year that the name has ever been in the Top 1000. With 206 births, Magnus ranked at #958. In Iceland, Magnús (pronounced MAHG-noose) ranked at #7 for the year 2007. In recent years, Magnus has also ranked at #4 in Norway, #8 in Denmark, #180 in Scotland and #300 in British Columbia, Canada. Share your thoughts on the name in the comments below! Recently, I was looking over the post I made last year regarding Colonial names. Since tomorrow is Thanksgiving, I thought I'd cover colonial names a bit more. 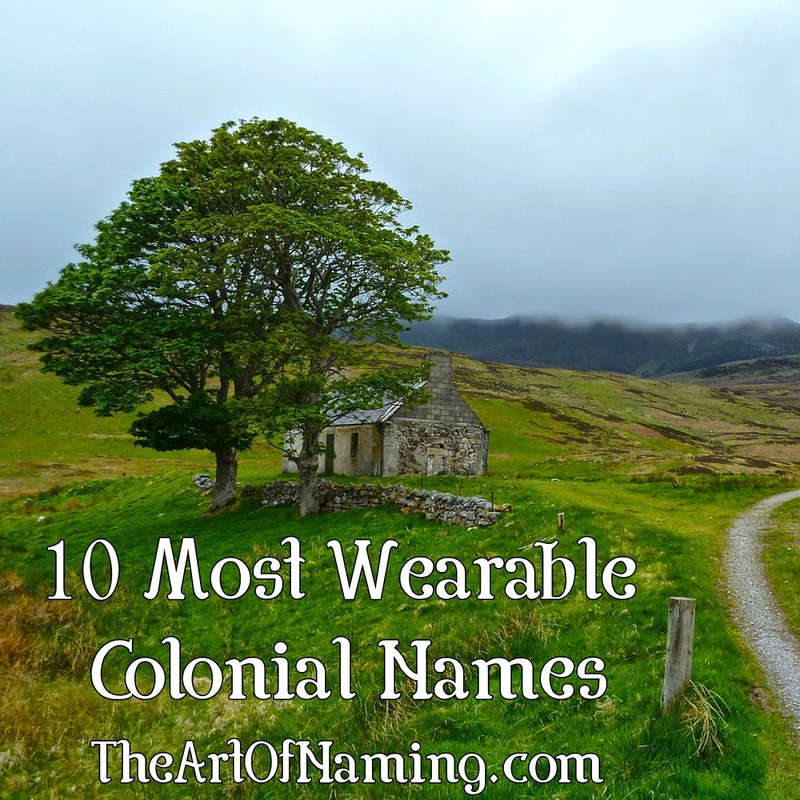 Colonial names are full of history and laced with virtues and biblical associations. Sometimes these names are even comprised of long phrases. You probably won't see many boys named Comfort or girls named Modesty today, and something like The-Peace-of-God or Fight-the-good-fight-of-faith probably won't work well for official documents. This led me to wonder what the most usable, wearable names that were favored in early America might be. With much thought, scrutiny and consideration, I narrowed it down to my top 5 boy names and top 5 girl names that date back to the colonial era but can still sound fresh and usable today. The lovely Charlotte is the French, feminine form of the name Charles which is typically listed as meaning "free man". Modern parents love this name so much that it now ranks at #11 in 2013. If that is too popular for you, there are plenty of other forms of the name from Lottie to Charlize to Carolina to Karla. This name dates back to England in the 16th century as well as the colonial times here in America but Charlotte is definitely usable today, too! This name dates back to Queen Eleanor of Aquitaine, the wife of King Louis VII of France in the 12th century. Eleanor became popular in England during the Middle Ages before it was carried to Colonial America. While there are plenty of diminutives and other similar forms of the name, Eleanor itself ranks at #106 in 2013 and has been climbing steadily. It may land in the Top 100 soon which means it is definitely very wearable. Hannah gained use in Europe after the Protestant Reformation and the Puritans took it with them to Colonial America. This is one of the many biblical names that gained favor in that time period. It is a Hebrew name meaning "favour" or "grace". It is related to Ann, Anne and Anna which were also used in those days. In modern times, Hannah's popularity peak happened in 2000, reaching as high as #2 in the US. She's declining now but was still ranked at #23 in 2013. Another biblical favorite, the Greek name Lydia actually refers to a region in Asia Minor called Lydia. Like Hannah, this name has been in use since the Protestant Reformation. In the US, Lydia had small peaks of usage around 1916 and in the 1950s, but it is at its highest ranks today. With over 3200 baby girls given the name in 2013, it ranks at #96! Susanna is the Greek form of the Hebrew name Shoshannah. It is said that it means either Lily or Rose in Hebrew and possibly Lotus in Egyptian. Susanna was used in the Middle Ages and was common after the Protestant Reformation in Europe but mostly as Susan. These days, neither Susanna nor Susannah rank within the US Top 1000. Susanna ranked well until it fell out of the Top 1000 in 1998. Despite the low rank, Susanna is a lovely name that deserves more modern day usage. Post-Reformation, Amos was very popular among the Puritans. Meaning "carried" in Hebrew, this is an Old Testament name that has been regularly used in the US at least since records began in 1880. It did well around 1920 but declined afterward. Currently, the name is on the rise again! It ranked at #778 in 2013. With the newly trendy S-ending for boy names, Amos should fit right in. This name has a long ancient history. It is possibly the Greek form of a Persian name meaning "far sighted" or "young" but it is also associated with another Greek name meaning "lord". Most notably, it was the name of several Persian kings, including Cyrus the Great of the Old Testament. It was well-used by the Puritans after the Protestant Reformation. In the modern US, Cyrus has been ranking in the #400-500 range for the past decade, ranking #436 in 2013. It is a cool, handsome choice that would work well on a boy today. A form of Elijah, the biblical Elias was used in the Greek New Testament, therefore making it popular among Puritans in Colonial America. There were many similar names beginning with El- that were used in those days, but this one in particular is already gaining popularity in the modern US. It has been on an upward path since the 1980s, ranking at a high of #113 in 2013. Another name that popped up after the Reformation, Levi is a biblical favorite meaning "attached" in Hebrew. This name ranks fairly well in many countries including #2 in the Netherlands and #23 in New Zealand. In the US, Levi has been climbing straight up the charts! In 2013, it hit a record-high #50 with over 7,300 births. With biblical history and the flair of the coveted letter V, Levi is definitely wearable today. Silas is the short form of Silvanus, which in Latin refers to "wood" or "forest". This is another biblical name that popped up Post-Reformation among Puritans in Colonial America. Today, Silas is quite favored in the baby name community. The numbers agree: Silas has been climbing straight up the chart since around 2000. It currently ranks at #116 and will probably keep going up! Which of the above names do you like best? Do you like any other names favored by the Puritans? Share your thoughts in the comments below! Welcome to my new segment "Get To Know!" Recently, I've had the opportunity to meet a few fellow name bloggers and I decided it'd be lovely to let you get to know them too. The naming community is such a wonderful place! If you truly love names, it never hurts to follow more bloggers to get your daily name fix. Today, I had the honor of interviewing Meagan from TulipByAnyName. 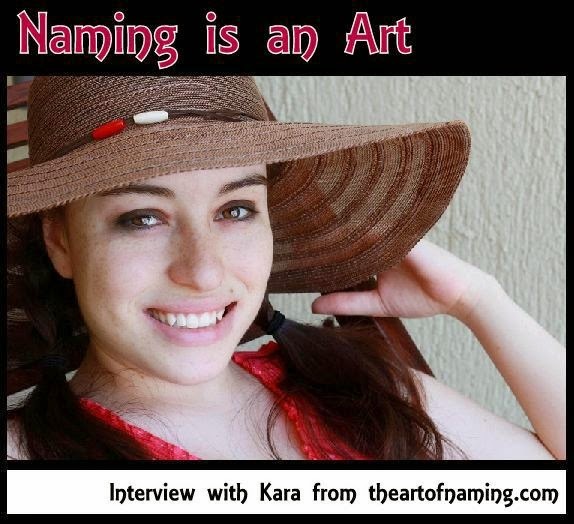 She is most known for her work discussing interesting names on her YouTube channel. She is also one of the six Name Sisters who run a great YouTube channel collectively. My name is Meagan Elizabeth. 2. Do you like them or would you ever want to change them? I really like my name. It's not what I would have picked for myself, but I can't imagine being called anything else. I feel very connected to my middle name, Elizabeth. It's one of my favorite names and a name that I would consider using. 3. If you had to change your name, what would you choose? I love this question! My taste in names and my style tends to be a bit old-fashioned. I think the name Rose would suit me. I also really love the name Cordelia, so I'd rename myself Rose Cordelia. 4. When did you first become interested in names? My first name memory was around age 3 or 4 when I renamed my cabbage patch doll. He came with an adoption certificate and the name Otto, but I renamed him Murphy. I have no idea where I got the name Murphy from! All throughout elementary school I was naming and renaming dolls, stuffed animals, and inanimate objects. As a teenager my interest in names progressed to looking up name meanings and making endless name lists. 5. What were some of the first names you remember loving? Do you still like them today? My favorite girls names growing up were Samantha, Elizabeth, Stacey, Caroline, Hope, and Emmeline. Stacey is the only one I've fallen out of love with. I still love and would consider using Emmeline and Elizabeth. For boys I loved Jeffrey, Patrick, Benjamin, Brayden, Dylan, Connor, Joshua, and James. I think they're all nice names. I can't see myself using Jeffrey or Brayden. I still really love Benjamin and James. 6. Tell us about your presence in the naming community. Where are your sites and what do you try to accomplish with them? A few years ago I realized there were other name enthusiasts on the web. I started connecting with others through forums, which evolved into creating a YouTube channel about names. I really enjoy making videos and of course talking about names! I created a blog as an extension of my YouTube channel, as well as an Instagram account @tulipbyanyname. I truly enjoy learning about names and sharing my passion with others. 7. What is your favorite girl name in the Top 100? Top 1000? 8. What is your favorite boy name in the Top 100? Top 1000? 9. What is your favorite first and middle combo for a girl? Emmeline Elizabeth - nickname "Emmie". I've loved Emmeline since I was 12, and Elizabeth is a family name. 10. What is your favorite first and middle combo for a boy? Lucas Gabriel - I'd call him Luke. 11. What are your favorite obscure/guilty pleasure names? I've really loved the name Lavender lately! I think it would make a fun, unexpected middle name. I also enjoy Avonlea, Everard, Frost, Wednesday, Winslet, Wolfram, and Forest. I'm not the bravest namer, but I do think these are the kind of names that would make great middle names! 12. If you had to name twins right now, what would you choose? 13. Are there any names or naming trends that you dislike? I'm not too fond of creative spellings. My name isn't spelled the most common way, so I don't mind a subtle change, I just don't like when a name is unrecognizable. Place names with creative spellings are one of my naming pet peeves. 14. Who is your favorite name blogger? Tough question! If I had to pick, I really admire Abby Sandel (Appellation Mountain). She puts so much research, thought, and heart into her articles. 15. 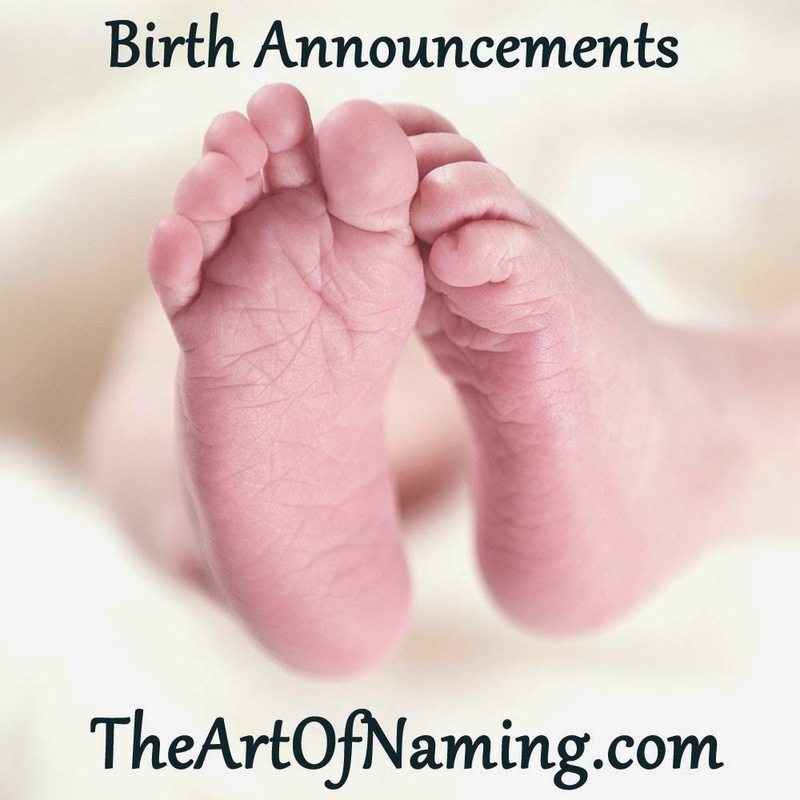 What advice would you give to expecting parents who are looking for a name? I think the most important thing is to pick a name YOU love! Many people will have an opinion, but ultimately it's your choice. I think it's helpful to say the name out loud with your surname. Also, reflect on if the name is one you or your partner would have liked to have been named. There are so many names I adore, but wouldn't actually want to have been named. My one big piece of advice comes back to following your heart and using a name you love! I hope you enjoyed this interview and that you'll take a look at Meagan's sites! You can check out my interview over on Meagan's site here. This compilation of birth announcements came from a couple hospitals in Indiana, USA. This batch seems to be rather conservative and traditional. There aren't any wacky or odd names that stand out. 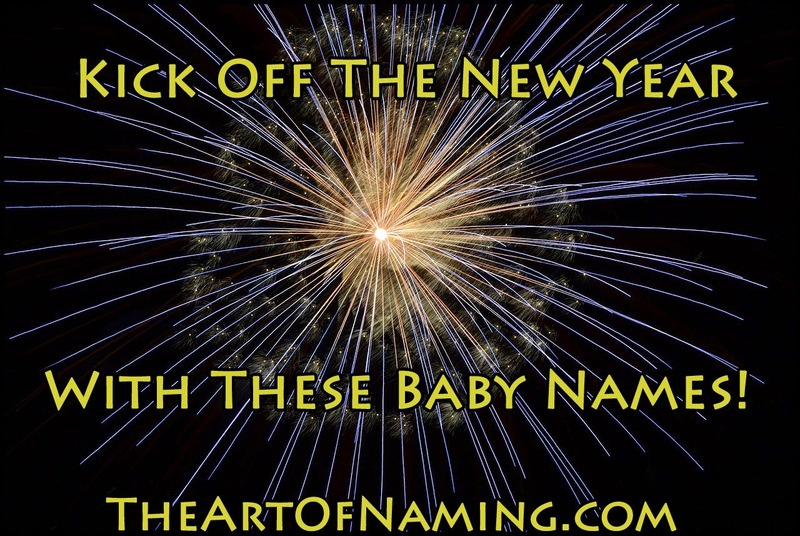 If you could only name your child one of these names, which would you choose? Let me know which of these you like most in the comment section below! 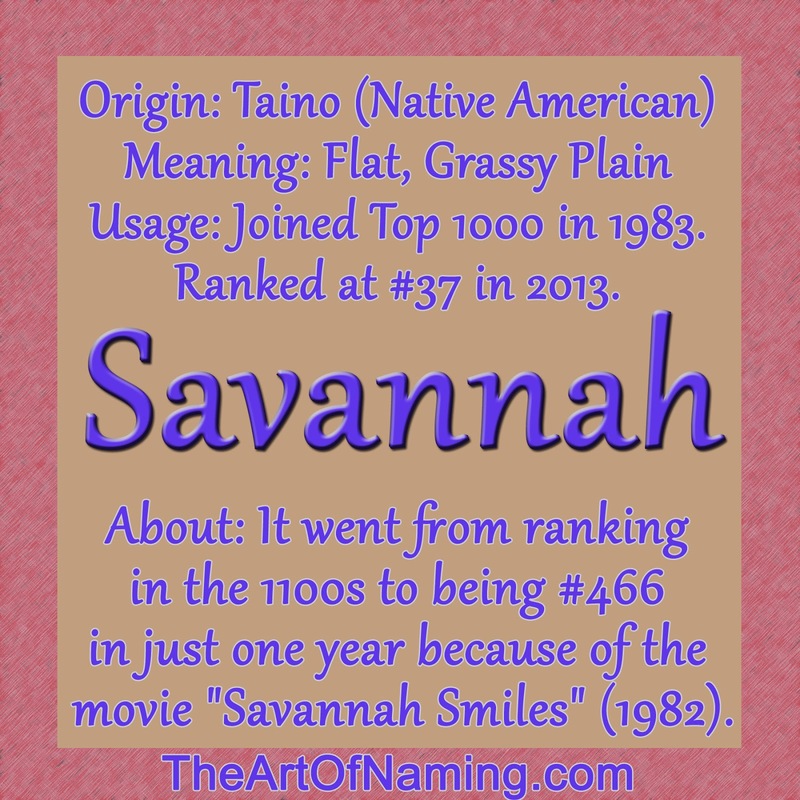 To complement Tuesday's post regarding the best V names for girls, and last week's post about the best V names for boys, I chose to feature the feminine name Savannah which contains the letter V.
Savannah isn't just a city in the state of Georgia, USA. It comes from an English word that indicates a large, grassy plain. Originally, Savannah comes from a Taino (Native American) word zabana. Variants of the name include Zavanna and Savanna. It's a place name and a nature name. Savannah gained usage as a baby name in the 19th century. It has also been on record in the US every year since 1880 but its usage was very minimal until it suddenly boomed in the 1980s. This increase in births-per-year is most likely a result of the 1982 movie "Savannah Smiles". There were only 43 births in 1981, 118 in 1982 and in 1983, there were 434 Savannahs born. That means the name went from ranking in the 1100s to being #466 in just one year. The year 2000 had a record-high amount of Savannahs born. There was 7,097 of them for a ranking of #37! Since then, the name has declined a bit in popularity. As of 2013, it still ranks at #37 but that only accounts for 5,192 births. This name is very cute yet classy. It has a elegant vibe to it but it is also a nature name that gives you the image of a grassy plain. It is both sweet and strong and great for a baby, a teen and a woman. Right now, Savannah feels as though it is a bit underrated. It isn't high on the popularity radar in the active online baby naming community even though it ranks #37 in the country. It ranks down at #207 on Nameberry, which is based on pageviews on their site. It is being used well but at the same time, it isn't being overly talked about which makes it ideal. Even though Savannah is technically popular, it would still be refreshing to hear on a baby today. The letter V has a certain appeal to it that has been captivating modern parents, especially the Av- and Ev- names. 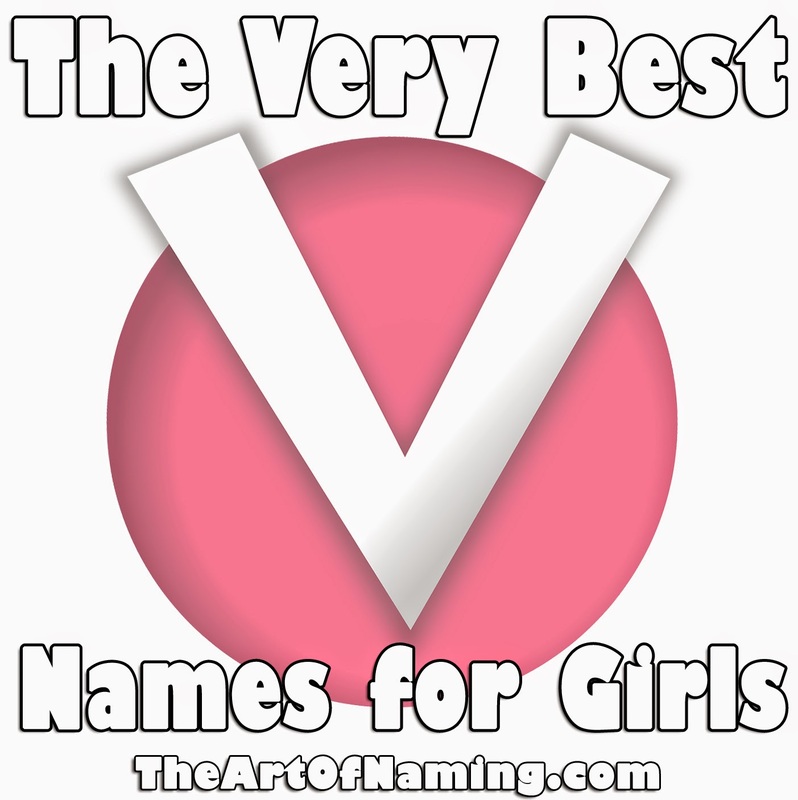 This is a compilation of the best girl names that contain the letter V. It may seem long, but trust me, I narrowed it down quite a bit. There just happens to be a lot of lovely name options with a V in them! Which of these do you like best? Don't forget to check out last week's list of The Best V Names for Boys too!